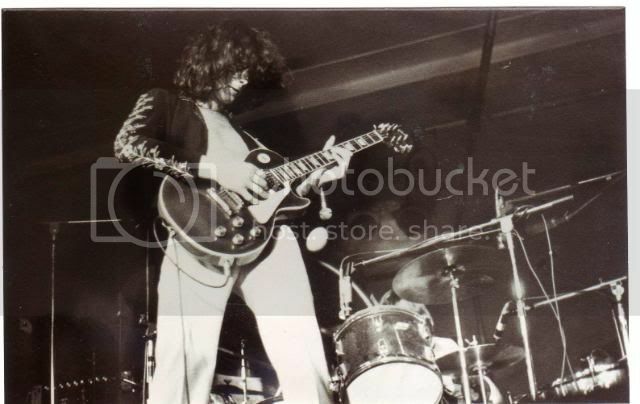 Jimmy Page ... History of his Guitars !!! huw is that the same article where he mentions using #2 on "Take Me For A Little While"? If you can find an old copy of that magazine, it's one that's well worth reading. Yep - that's the one. He can't find the sound he's looking for to use on the solo, so he finally gets out #2, switches to out of phase, and off he goes. My rhetorical question about that has always been "If #1 had out of phase switching at the time, why would he have needed to use #2. I have always taken it as a clue that #1 still had no wiring mods during that album. This is truly one of the greatest threads ever! Here's a rarity - the until-recently-unknown 1977 guitar. This was ONLY EVER used on the 1977 US tour as a backup, along with #1 & #2. It might look like #3 - the red Norlin that has now got the B-bender - but it isn't. The binding in the cutaway is different (narrow 50s style on this guitar & wide 70s style on #3), the proportions of the headstock are different, and the placement of the Gibson logo is different. Theory 1 - the Michael Corby guitar. 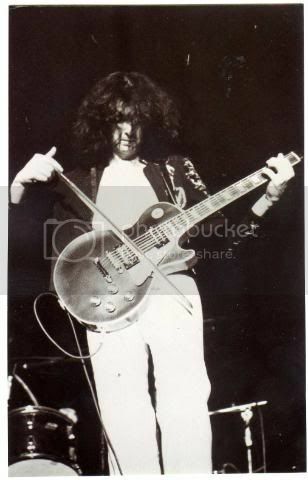 The guitarist from The Babys has a recipt of sale from Dec 1974 showing that he sold Page a 1952 Goldtop Les Paul sprayed red & converted to humbuckers. The trouble with this is that 52 LPs had a shallow angle where the neck joins the body because they originally had trapeze tailpieces. To put a tune-o-matic on there would involve a neck re-set to change the angle. The logo also sits too high on the headstock for an early 50s LP - the high logo comes in about 1958. Conclusion - If it is the Corby guitar then not only was the neck re-set, it was replaced with a later one. Theory 2 - its a 1958 Goldtop. 58 was the first year of production for the Sunburst model, but some GTs were made early in the year. We get the logo position explained, the colour of the back & neck fits, as does the paint colour (red over gold). It's possible, but why the black pickup rings? 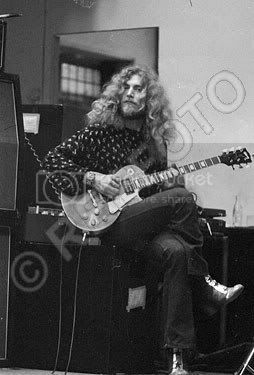 That was what Gibson was selling in the 70s as aftermarket parts (see the Norlin). A 58 would have had humbucker (and their mounting rings) as standard. Theory 3 - the "Les Paul Standard 58" reissue model from the early 70s. My reaction to this theory was a big WTF? I've never heard of this model so I looked it up. These are obscure to say the least. 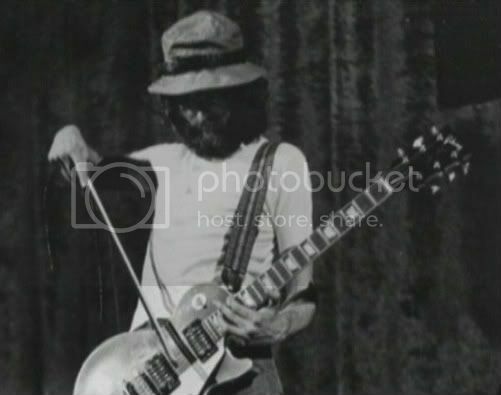 In the reference section of The Interactive Gibson Bible it is listed as in production from 1971 - 73, being based on the 1954 LP (bizarely NOT the 1958) therefore Goldtop, P90s, wraptail bridge. The book doesn't comment, but my LPF source added that we get thin binding & no pancake body. Interesting. So I cross reference with the Tony Bacon/Paul Day Gibson Les Paul Book - they don't mention the "standard 58" name, but have this to say: "...a new Goldtop re-issue was launched by Gibson around 1971, this time with the wrap-over bar shaped bridge/tailpiece of the type fitted to the second version of the original 1950s model. It also had the narrow binding in the body cutaway characteristic of 1950s Les Pauls, prompting suggestions that Gibson were using up old bodies. This Goldtop lasted until about 1972, but did not appear on the company's pricelists." So, a re-issued early 50s GT, that would probably have the high logo, but would need converting to humbuckers & tune-o-matic (there's those black pup rings!). Old body = no pancake. What a story - but it fits where it needs to. Well folks, I think I've done my bit on this one & I don't actually care (much). I'm satisfied that we have proved that there is a new guitar to add to the lists. Personaly I like theory 3, because it's so bonkers - Jimmy has one of a particularly obscure model of LP, then converts it to look like something completely different! However theory 1, with Mike Corby's evidence & all, look like the sensible bet. 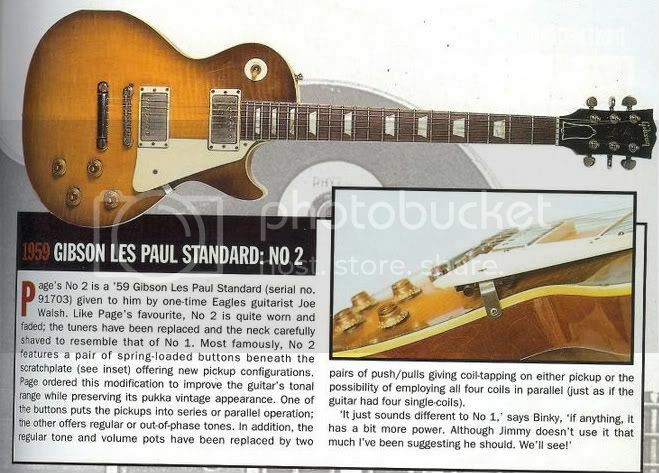 It sickens me to actually read the misinformation about that guitar being the Joe Walsh guitar. That mis-info has been propogated for years now, all because of this article. Not just that one, I'm afraid - lots of articles & books have got it wrong. In my opinion the guilty party is Tim Marten. He was Page's tech in the 80s & he was the one who seems to have started the whole BS runour about #1 being a 1958. Once that was out there, people began mixing up #1 & #2 all the time. "Walsh sold Page a 59." "But #1 is a 58"
"Walsh must have sold him #2"
Have you got more pics of that guitar? I would like to take a crack at it. Need pics of the back of the head though. And the front........of course, a serial number would really help! I doubt that is available. His #3 is most like a late 1969 model because it has a pancake body but no volute and a large head stock. You can see it in Whole Lotta Love on The Song Remains The Same. 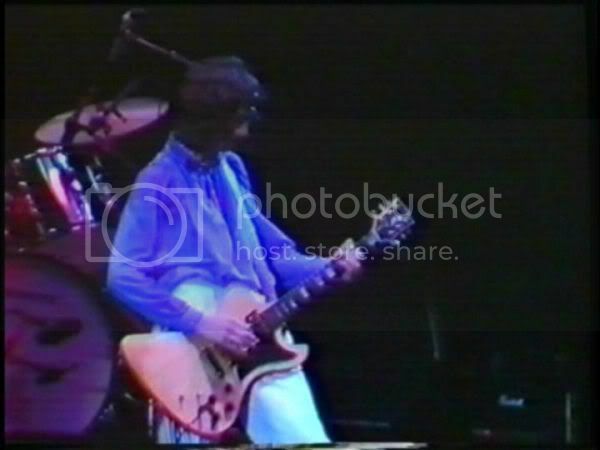 I think it may have even affected Gibson in the early 1990s when they developed the first Page guitar (1995 first year of production); it was more like #2 with the flame on the top and the 4 push/pull pots. huw, one possibility for the black pickup rings you mention in Theory 2 is it could be a 57?....I've not looked into it so just a guess. I know. It was from a magazine few years back when we all thought the earth was flat. #3....Look at the machine heads and the truss rod cover. Aren't those different machine heads than the ones he had on it for The Song Remains The Same? Is that an original 57 GT? Something doesn't look right. I am no expert on them. But I don't remember seeing one with black plastic trim. And certainly not one with a 5 ply pick guard; those were used on LP Customs. Also, that head stock looks a little big. But maybe it is just the camera angle. Correct. The ones in the August 1970 photo are Grover Imperials. They were still on it in March 1971 when Plant was seen with it. Next known use of Page with it is January 1973 and it still had them. No evidence of it in use on the '73 Euro tour in March/April yet. So it's not until the '73 US Tour we first see the kidney bean Grovers. He needs to throw that ugly thing away! Yes i do beleave it is "all original", Black parts were used for the first month when gold tops acquired the newly produced paf's. The pick guard is also correct, its the same on used on Custom's but cut fot two humbuckers. Yes i do beleave it is "all original", Black parts were used for the first month when gold tops acquired the newly produced paf's. The pick guard is also correct. Some 1957 and 1958 Les Paul goldtops are seen with dark brown backs. These "dark backs" are easy to identify by the serial number, which is ink stamped with yellow ink (instead of black ink, as used on the light color backed goldtops). Also darkback Les Pauls will have black control cavity plates (as used on the Les Paul Custom) instead of brown plates. Humbucking PAF pickups replace P-90 pickups around serial number "7 2000" to "7 3800" range (latest 1957 goldtop documented with P-90s is serial number "7 38xx", and the earliest is a leftie PAF goldtop "7 13xx"). During this period there was definately overlaps of Goldtops with either P90 or PAF pickups. First few months of humbucker pickup production used brushed stainless steel pickup covers (instead of nickel plated covers) with no PAF stickers. Resistance of the new pickups ranged from 7.0k ohms to 8.9k ohms. 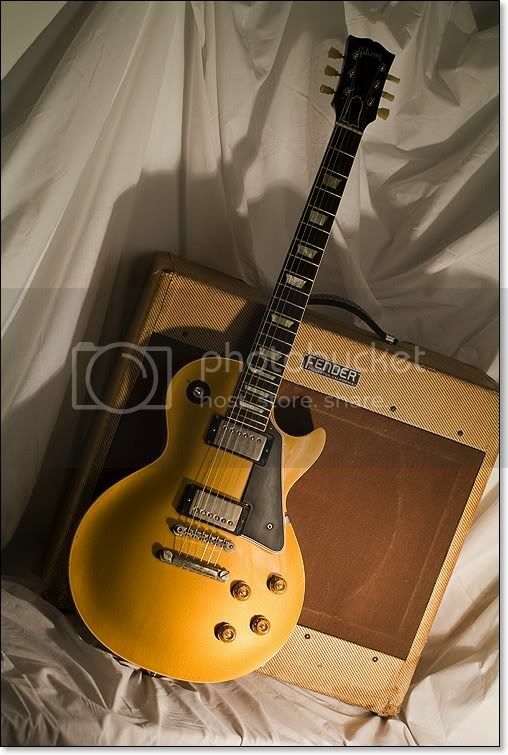 The first month of humbucker Les Paul goldtop production used black plastic parts (pickguard, pickup rings, switch surround), with black parts ending by about serial number "7 32xx". All black plastic 1957 Les Paul Goldtops should have a dark back (if it doesn't, chances are someone stole the cream parts and replaced them with black parts). Within a month or two, PAF goldtops changed to cream plastic parts (cream part PAF goldtops not seen before serial number "7 3000"). Generally speaking black plastic part 1957 Les Paul goldtops are worth less than cream part 1957 goldtops though. The black and cream plastic humbucker pickup mounting rings had "M-69" as part of the molding, on the bottom side between the height adjustment screw and mounting screw. Also the plastic humbucker rings had four "screw tunnels" for each mounting screw (but not for the two pickup height adjustment screws). Though the M-69 pickup surrounds were used until about 1970 (in black, when they were replaced by the M-8 pickup rings with no screw tunnels), Gibson did not use cream colored M-69 pickup rings any later than 1960. That's why there's such a big deal about original cream-colored 1950s Les Paul pickup rings, because original M-69s in cream were unavailable after 1960. Though these seems like minor details, original plastic parts are important to these guitars. Also the "Gibson" peghead logo moved closer to the top edge of the peghead (as positioned on all other Gibson models) in later 1957 (1957 PAF Goldtops can have either the low or higher position "Gibson" peghead logo). Also seen in 1957 are goldtops with a single one piece body of mahogany and no maple cap. These mahogany topped goldtops are rare (the mahogany top can be seen thru the pickup cavity route).